Taste is very subjective of course, but I don’t get much tartness from Peach (Juicy) TPA. To me it is what it says on the bottle… a juicy ripe and sweet peach flavor. No you wattage seems fine. Juicy peach tpa or whatever the name is…is more of a peach ring type peach…for me. You will need to try and add another peach or two. White Peach FA or Peach FA. Or an inw version or others. I use (JF)'honey peach a lot, my favorite peach after all, I don’t think you will be disappointed. All I can recommend is, start low, it’s a extreme potent flavor that does fade/mellow out a little bit still overruns everything and anything if not careful. nice, Im going to try to make a Peaches and Cream with the honey peach. How do these percentages look? I can only base the next statement on my personal experience and taste. This might be not the same for you, therefore test the flavor prior but if you want to taste the cream(s) and not just have thick peach syrup, i’d lower it. Since you’re not using very heavy creams here. I’d try it between .75-1.25% in that recipe if you stick with these creams. Late response @EagleSpiritWolf but @estorm’s right !!! Yeah you’re right Peach is a very strong flavor. It totally mutilated any recipe I made with it over the last 4 months. When and if I use Peach now I use it very very very low as a small back note flavor. Because in your face Peach is really disgusting when Vaped for me personally. 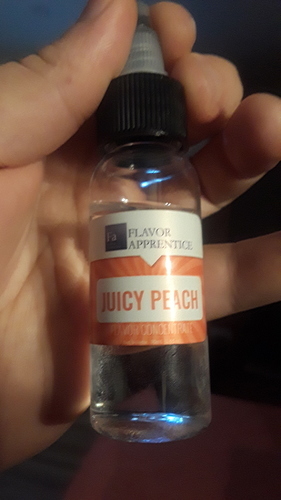 Are we still talking about TPA Juicy Peach ?? If so, my experience is it’s pretty good as a juicy peach, but I typically have to mix it pretty heavy, as it turned out not to be as strong.